Chapter 3 – Brand Promises: Who or What Are You, Metaphorically Speaking? Do you own a PC, or are you one of those Mac people? Personally, I’m pecking away at this moment on a cookie-cutter Dell laptop (that would be a PC) on Microsoft Word, which runs on Microsoft’s Windows platform. It’s relatively dependable—not very exciting, but it does what it’s supposed to do for the most part, and it easily communicates with the other PCs in the office through our network. Of course, I know other folks with Apples. You know some too, no doubt (or maybe you are one of “them”). I actually picture myself as more like a Mac person than a PC person. Do you know what I mean when I say Mac person? You’ve probably seen the Apple ads over the last few years, with the two characters Mac and PC. Mac is younger, hipper, more casual, and relaxed. He’s also, according to the ad, brighter and more competent. PC, on the other hand, is dressed in an uncomfortable-looking suit, he’s older, and more anxious, apparently for good reason. He has a serious streak of insecurity and is constantly try­ing—unsuccessfully—to best Mac. These ads resonate with viewers, and when we look a little more closely, there’s a solid irrational basis for why these spots are so effective…and also some food for thought as to how you develop, communicate, and “live” your own brand. As we’ve already discussed, the predominant thought process in each of us resides in the subconscious or irrational recesses, in the area of the brain that generates our most powerful ideas and impressions, the area that dictates how we feel and act. It stands to reason. After all, as we’ve discussed earlier, research shows that 95 percent of our thought processes take place in the irrational, emotional subconscious. In other words, we think (whether we know it or not) through our emotions. One of the interesting lessons to be gleaned from the explosion of neuroscience research over the last fifteen years is the discovery of just how central a role metaphor plays in how all of us take in, process, store, and communicate ideas. From a business perspective, metaphors can allow a much deeper, even subconscious, emotional connection between your company and your customers. In short, at our deepest and most fundamental, we think in images. However, given our irrational, emotional brains, we aren’t always aware of it. The distinction is effectively raised by Gerald Zaltman in How Customers Think when he says, “An important difference exists between how a thought occurs (neural activity) and how we consciously experience a thought, if at all, once it occurs.” And much of “how a thought occurs,” most research indicates, is as images. Further, Zaltman goes on, while the stimuli we receive include all five senses—sight, sound, touch, taste, and smell—what those different experiences or inputs trigger is an image of some sort. So, for instance, if you hear a snippet of a particular song (let’s say The Clash’s “London Calling”), it might evoke a sudden image of your younger self in the backyard of a long-ago friend’s house party the week when you were graduating from high school. At least it does for me. So, while we all use language to communicate with each other, and to some extent “consciously experience a thought,” the emotional, irrational subconscious processing that we do—the thinking that really drives our behavior—is image based. And that is where the use of metaphor becomes so important to understanding how your company is being perceived, as well as to designing how to present the company brand. Before I get too deep into this topic, let me define what I mean by metaphor. According to Webster’s, it means “a word or phrase literally denoting one kind of object or idea is used in place of another…” That may be overly simplistic, but it serves our purposes. In particular, I’d like to explore metaphor as visual representations of ideas and brands. In its simplest form, then, it’s a way of saying that “this” is “that.” For example, my day was a real bear. On the road of life it’s important that you don’t burn bridges. When shooting hoops, I was on fire. You get the idea. And while at first blush this might seem like a simple rhetorical device, the use of metaphors runs much deeper. According to Zaltman, the typical person peppers six metaphors per minute in his or her spoken language. It’s core to how our brains work. Let’s look back at our example of Mac versus PC. Obviously, Apple is a large, global public corporation, with thousands of diverse employees of all stripes. And yet, through some research and clever advertising copywriters, Apple was able to land on the perfect (some might even say obvious) metaphorical representation of the company…or, rather, on the public’s existing metaphorical perception of the company, that of “Mac” to Microsoft’s “PC.” In a way, that representation, through the hip, young, casual creative type of person, is the “anti-Microsoft.” And that’s an important point. They weren’t making up the metaphor of how you should see Apple. They were simply tapping into the metaphor that already existed in the consumer’s head, created over years through Apple’s successful positioning of its brand. The power in the ads, of course, lies in the dramatic contrast between hip Mac and old-school (and, frankly, kind of lame) PC. By personifying Apple, and then doing the same with Microsoft, the ads reach down to a deeper emotional core. Instead of saying, “Apple computers and software are designed to be very intuitive, with the goal of allowing users to accomplish a variety of tasks in an almost effortless manner…oh, and we’re cooler than some other companies we care not to mention,” the ads communicate that message visually through metaphor. And this sinks into our subconscious, making powerful impressions and connections. In the past, advertisers have leveraged metaphor in two distinct ways. First, a company could use customer research to acquire insight into a customer’s view of the company. It could, for instance, conduct focus groups to understand how customers picture them. This allows the company to gain some sense of customer perceptions regarding its qualities and values, without requiring customers to simply make their best guesses as to those qualities and values. There are several methods for digging into this issue, one from Zaltman called the metaphor elicitation process, with some techniques more effective than others. The other side of the metaphorical coin, regarding how companies utilize metaphors, relates to how companies pre­sent themselves to the marketplace in a particular light. In other words, it’s using metaphors as a communication strategy, as opposed to a research tool. That’s exactly what Apple is doing in its broadcast ads with Mac and PC. But almost every company uses metaphor in some way, even if not as sophisticated. Think about your own organization. Do you have a logo? Isn’t that just an image that represents something more? By designing a logo and dropping it into your stationery, business cards, website, etc., you are trying to establish a brand anchor in the minds of prospects and customers. The logo isn’t your company; rather, it’s an image or metaphor that makes people think of your company. Whether, when a person sees your logo, it evokes positive or negative emotions in his or her irrational subconscious is a question you may need to answer. No matter your company’s current situation, metaphor deserves a special focus when discussing your brand. If, in fact, we think metaphorically (i.e., thinking of “this” as “that,” especially in images), wouldn’t you want to spend some time exploring your company’s identity in the same way? To be clear, when I say, “brand promise,” I’m not asking about positioning, which is more a strategic discussion, wherein you map out the market position of your competitors and contemplate how you can carve out a position or spot in the market and in your prospect’s mind. Determining your positioning is a key discussion in your company, but it is more cut and dried; it is purely a business consideration. Brand promise moves to a different, more emotional level. Positioning is really about pure strategy. Brand promise is about an appeal to the customer. We feel it’s absolutely critical to understand what it is that this particular company is promising to prospective and existing customers. What, in other words, are the customers’ expectations when they “buy” (whatever that might mean)? What is the distinctive value proposition? Some might even describe it as the company’s soul. Surely a company that generates billions of dollars in revenues each year begins all new work and initiatives from a common, consistent, and unique brand promise—a raison d’etre, if you will—right? “The Question,” as we call it, is almost always followed by an interesting, albeit uncomfortable, moment—the pregnant pause as the question flops about on the table, a couple of nervous snickers, and furtive glances at the boss, the other attendees afraid to venture a guess for fear of unveiling their ignorance. After a minute or more of hemming and hawing, we’ll get a response like, “Uh, what exactly are you looking for when you say brand promise?” Or, just as often: “Well, we’re a, uh, high-quality (or ‘world class’ or ‘industry-leading’), low-price (or ‘efficient’ or ‘quick to market’) global service provider (or manufacturer or distributor).” Other attempts at articulating a brand promise typically devolve into a several-paragraph-long dissertation regarding the company’s goals and mission. And, of course, there lies the problem. When the senior management team of a large organization is simply incapable of articulating what it is that, at its essence, the organization does for its customers, it means there is no starting point. And even if the C-level executive group “gets it” and can easily state the company’s compelling brand promise, the message typically deteriorates as we move to the next management layer. Most often, by the time we’re talking with front-line employees, the concept of “brand promise”—if it existed at all in the upper echelons of the company—has completely disappeared. When we begin an engagement with a client that has no satisfactory answer to our question, it makes our job extremely difficult. Without a unified, distilled brand promise, there is no anchor, no foundation. Whether dealing with issues concerning the company’s promotion of a product or service, prospecting for new customers, customer communications, or customer service, there is no common starting point. So, if there is no senior management consensus on exactly what the company’s brand promise is to its customers, we try to help them come up with something. Something is better than nothing. Apple, it seems, wears its brand on its sleeve. That brand—the mantra under which it operates and the unique value it promises—can be articulated as: “Technology for humans.” And that philosophy manifests itself through all aspects of the business. You not only see it in the ads, but in its commitment to its customers (or “fans,” “devotees,” “evangelists,” or whatever you want to call them), their commitment to intuitive usability of its hip products, even the fonts on its documentation. The advertising all displays a commitment to being personal, cool, and connecting in a human way with users. Microsoft, on the other hand, seemed to rely on the concept of “ubiquity” over “uniqueness.” But ubiquity isn’t a brand promise. It’s a business strategy. Instead of identifying itself as a specific idea (or cause) to a particular group of people, it was “everything to everyone,” the result of a licensing strategy that placed Microsoft operating software in the vast majority of the personal computers sold in the United States. As a consumer, you didn’t really seek out Microsoft products; more often than not you simply felt you had no other choice. In fact, in doing a bit of research to help determine exactly what Microsoft’s brand promise is, I came up largely empty-handed. The message seems to change over the years, and schizophrenia does not contribute to the success of a company. No consistency leads to no long-term brand equity. Of course, one might argue that Microsoft is the winner here in terms of market share, capitalization, etc. But the game isn’t over, and with the success of Apple’s iPod and iPhone product lines, as well as inroads in personal computers and software, time will tell who, if either, (did somebody say “Google?”), will take a commanding share of the market. Just What Is a “Brand Promise” Anyway? No doubt you hear a variety of terms like brand, brand promise, and positioning as you discuss your company’s image. It can get confusing, and not just for you. Part of the problem is that many of the practitioners in this arena use these terms in different ways, so let’s make sure we’re at least using them consistently in this book. Brand—In short, your “brand” is more a result than an intention. It’s the perception your company has created in the minds of prospective or current customers as to who your company is and what it stands for. Brand Promise—Some call this brand essence. The brand promise is about company intention (as opposed to results, which is how the ultimate brand is measured through market research). It’s really the distillation of what makes you distinctive as a company, and what expectations you are creating for your customers. An example would be Volvo, which could be described in just one word: safety. Positioning—This, as we briefly discussed earlier in the chapter, refers to the “space” your brand occupies in relation to other brands in the same category (for example, Tide versus Gain laundry detergents). Positioning is about defining a space within a market, by either bumping up against other players in the market (like Apple does with Microsoft) or through leveraging another brand altogether like saying you are the “McDonalds” of Indian food (i.e., your service is fast, the restaurants are clean, and the food is the same from one location to the next). It doesn’t matter what size the company; this slippery concept of brand promise is a problem that many organizations don’t even know they have. But it is, indeed, a big problem. At Vox we see a brand promise as a requirement—Square One, before any communications or other business efforts can take place. The challenge that we see with many of our clients is that they mistake a recitation of benefits, or worse, services, as a brand promise. But they are missing the point. The brand promise must reach deeper down, into emotional, and yes, irrational territory. A brand promise must drive a consistent message…no, more than that: a commitment, which can nestle into a spot in the subconscious of your potential customer. It must be real and it must be sincere. In other words, it must be a promise on which you are able to follow through. As we’ve seen, customers think in images. They feel and act based on what images are evoked based on your company’s communications and interactions—both intentional and unintentional. So to ask customers to simply, on a logical, conscious level, articulate whether they “like” or “dislike” your company, and to give you rational reasons for their feelings, puts them in an impossible situation. We use words and language to interpret our deeper, more irrational (and yet more compelling) thoughts and feelings, and as I’ll discuss in subsequent chapters, we’re not very good at it. Better to ask the customers to dig as best they can and provide you with the image of your company, which in turn gives you clues as to how your brand is perceived that are closer to the truth. So, one of the exercises we often employ with our clients is attempting to get at the real brand promise through metaphor. It’s a method that has been employed in advertising in the past and it’s akin to the PC versus Mac concept. The idea is to get clients to picture their company as if it were a person (some have used animals as well), tapping into the subconscious and irrational anchors for how they would perceive their organization. What would this person look like? What type of attitude would she display? Would he be wearing a suit or a T-shirt? Would she be wearing jewelry? Is he confident, polished, urban, small-town? Is she sincere, fun, charitable? The idea here is not to create the personification of your company but to attempt to define what it really is at this point in time. The Man in the Suit, or the Guy Next Door? As an example, let’s look at two companies in the insurance industry—Allstate and State Farm. There are similarities: Both are large, traditional, property and casualty insurance companies selling, among other things, automobile and homeowners insurance. Both are located in the Midwest and sell their products through exclusive agents and independent agents, as well as direct over the phone and online. There are also some differences. State Farm is a mutual company, owned by its policyholders, while Allstate is a public corporation, answerable to its stockholders for its results each financial quarter. But if you ask a group of consumers to personify these two companies, there’s a good chance you’d end up with two very different pictures. The person we call “Allstate” might be a white male, dressed in a conservative blue suit, very professional and corporate in appearance. The person we’ll call “State Farm,” on the other hand, might still be a white male, but would most likely be more casual in appearance and perhaps be in short sleeves and wearing khakis and a tweed sport coat. “State Farm” would more likely be a smaller town resident, more likely to coach in the local Little League, and more likely to be a member of the Rotary. Neither the image of Allstate or State Farm that customers or prospects might paint is necessarily good or bad. They are what they are: the result of countless exposures, news reports, customer communications, personal interactions, and stories from friends that build toward a universal impression. In your business, this personification exercise serves to paint a picture with customers or prospective customers of “who” they are right now, as a company. From there you must follow several more steps down the path to get to their real and valuable brand promise. It’s no secret that the airline industry is in trouble. Skyrocketing costs to do business have resulted in increased ticket prices, fewer seats due to fewer flights that are inevitably packed, smaller seats, luggage surcharges, fuel surcharges, and elimination of free snacks. Clearly, it’s going to be an uphill battle for airlines to survive. That customers are unhappy in general with their treatment within the airline industry was highlighted in a recent satisfaction survey and ranking by the University of Michigan. The rankings indicated that satisfaction was down for almost all airlines, and for some they were totally in the dumper. However, Southwest Airlines came out, once again, at the top of the heap. In fact, Southwest ranked number one for the fifteenth straight time in this survey. What, one might ask, is Southwest’s brand promise? Unlike most airlines, Southwest doesn’t make it a point in its advertisements to tell you about how comfortable its seats are or how attentive or luxurious its service is. In fact, it doesn’t even offer you an assigned seat. Furthermore, when you arrive at your destination, attendants ask you to help clean up after yourself so that they can turn the flight around more quickly. Yet year after year, Southwest continues to rank higher in customer satisfaction than the more expensive, more “prestigious” airlines. Why? The answer lies in a strong irrational dynamic at play concerning the concept expectations versus satisfaction. It states that all of us possess a tendency to be very happy if our expectations for a certain type of experience are met, which makes sense. An example used by Chris Denove and James D. Power IV in their book, Satisfaction: How Every Great Company Listens to the Voice of the Customer, is apt: If you are strolling into the lobby of the Four Seasons for a stay, you might very well have a “Louis Vuitton suitcase” of expectations. If, in turn, some small thing goes wrong—let’s say a piece of toast is burnt—and yet the rest of your visit is to your standards (fresh flowers in your room, personal service from the concierge, pillow menu, etc. ), you may be dissatisfied with your experience. Let’s look at the other side of the example: I was staying at a Hampton Inn in Birmingham, Alabama. In the morning, after a non-eventful night, I was preparing for an important 9:30 meeting with the senior management team of our client, an insurance company, and I realized with sudden dread that I had forgotten to bring any neckties. Now, maybe at the Four Seasons or Ritz-Carlton in Chicago one could expect to phone down to the desk and have a smiling employee run up in with a variety of ties to choose from. But this was at 8:45 in the outskirts of Birmingham at a Hampton Inn. There were no stores to speak of nearby, and I didn’t have a rental car. I walked down to the front desk to inquire as to any miraculous solution to my problem. The desk clerk called a co-worker, who ran outside and a minute later pulled the hotel shuttle van up to the door. He then sped me to an outdoor mall about four miles down the road that included a Men’s Wearhouse. Even though they weren’t open yet, I talked my way in and grabbed two ties off the table, barely looking at the prices. When the hotel employee dropped me back at the hotel with time to spare, it was all I could do to get him to accept a tip. He seemed genuinely happy that he was able to help me. To say I was satisfied with the Hampton Inn in Birmingham doesn’t do the experience justice. I was delighted. The lesson for companies is to remember that customers naturally process their experiences based in large part on their preconceived expectations—expectations set in large part by the brand promise—of that experience. And if the experience falls short of the expectation, even if by a seemingly trivial amount, we can be disappointed. Southwest started as a little regional airline in Texas. The story has been told countless times in the media, and in books like Nuts: Southwest Airlines’ Crazy Recipe for Business and Personal Success, by Kevin and Jackie Freiberg, so I won’t bore you with the evolution of the company, although it’s a fascinating study. The point is that, at the very beginning, Herb Kelleher, its president, stated the company’s brand promise by advertising: “Southwest Airlines—The Low-Fare Airline.” That was it. Yes, Southwest had fun and did crazy things in its marketing efforts (like dressing flight attendants in hot pants), but all of its business decisions were based on presenting the company as “The Low-Fare Airline.” By setting its standard on one core idea—an idea it is able to live up to everyday—Southwest meets, and often exceeds, customers’ expectations. Or consider my original example, in the Introduction to this book: Little Louie’s. What, would you guess, was Little Louie’s brand promise? I’m not sure Louie could articulate it at the time (as a 14-year-old I wasn’t thinking about it), but based on all outward appearances, there was no brand promise, beyond “hot dogs.” In fact, it was almost the lack of a brand that was its most prominent feature. And yet, really, I would argue that there was a brand, and it was infused in everything Little Louie’s did. From the old, hot storefront in which it was located, to the greasy fries spilled into the bottom of a plain brown bag, to the misbranded drink cups, and finally to the caustic—but often humorous—interactions between customers and Ed and Louie behind the counter, Little Louie’s brand was authenticity. It was real—what you saw was what you got—and that was what distinguished it from its competition. Let’s take another look at Southwest and the airline industry. What are some of the other brand promises put forth by the other airlines? Some, like American and United (“fly the friendly skies” doesn’t really resonate these days, does it? ), seemed to oscillate over the course of just a year or two, bragging about “more leg room,” even changing the seating configurations within many of their planes. It was not long before they were moving the other way again, trying to generate more money per flight by squeezing a larger number of seats—and customers—onto each flight. What happened to their brand promise? Any idea? No matter the method or processes you use, the key to creating a really successful brand promise and its proper positioning is based on what we call “finding the nugget.” The “nugget” is that one thing, a trait or belief, an attribute or philosophy that is core to your company. It is that thing that separates your company from the others in your industry. But that thing needs to be real and significant; it must be something more concrete than “the best car” (why?) or “the cheaper phone service,” unless, like with Southwest, you are willing to take the promise to the nth degree. In the movie Elf from a few years ago, Will Ferrell plays a misguided, very large Santa’s helper, who finds himself in New York City for the first time. He sees a sign in a diner window that says, “World’s Best Coffee,” and walks into the dank, depressing storefront to congratulate them on their achievement. The “promise” of world’s best coffee in that case, of course, is silly to the point of ridiculous, but it’s the type of mistake many companies make. The nugget you find must be real in order for it to be infused throughout your organization. For us at Vox, that critical, core attribute or belief revolves around the concept of empathy. It’s an emotional investment for each of us, and it centers in the commitment to understand the perspective of the customer, or the prospective customer. Internally, we talk about “walking in the customer’s shoes.” It’s not just a methodology but rather a primary approach to everything we do. It comes through in our marketing, in our engagement processes, and in how we interact with and reward our employees. We even developed a proprietary service, called the Customerspective™ Process, for understanding the “true customer experience.” It’s a process that includes a review of all of a company’s communications, interviews with employees, and customers and prospects, and an analysis to gain a comprehensive perspective of the customer experience. After attempting to personify your company, and after sifting through that list of attributes, characteristics, benefits, and beliefs that characterize your organization, you need to land on that “one thing” that distinguishes you from your competitors. What is your non-negotiable characteristic, the thing that gets employees up in the morning, that is unique to your organization? There are some guidelines regarding how to frame your brand promise. It should be short, and it should be simple. Short and sweet is imperative, since anything that’s longer than ten or twelve words is difficult for employees to remember. And if it’s difficult to immediately recall and recite, then it’s almost impossible to internalize, and that’s part of the goal when drafting the brand promise. Ideally, your brand promise should also be compelling, or at least an interesting turn of phrase. At Vox, for years we’ve based our brand on being “the voice of the customer.” Notice we don’t say “being empathetic to the customer, client, and employee.” That doesn’t sing! No, you need to create a phrase or sentence that catches the ear, and even more important, catches the imagination of your employees. If you don’t think you have a real brand promise, now’s the time. So get going! So…What Do I Do Now? Personify Your Company. This doesn’t need to be an extensive research project. Start with yourself. Paint a picture of who your company is. What are the traits that define it: humanistic, charitable, innovative, committed, cutting edge, traditional? The key here is to define it as it is, not as you’d like it to be. By fleshing out the personality of the business—as seen by employees, customers, and the general public—you can then decide if you can work with some of these existing attributes in order to build a brand promise and identity that are sincere and authentic. Only then can you create something that’s consistent and built for the long term. Find “the Nugget”. It’s there somewhere. We maintain that there is a distinctive and valuable trait within your organization, one that you can use as the linchpin for your core brand promise. Finding this nugget might not be easy, but it’s well worth the effort. Build Consensus. Does everybody on the senior management level really believe in the brand promise? If not, you’re doomed. It’s only when you have total buy-in, when everybody is on board, that you can successfully leverage the brand promise to drive consistent activity across all channels and functions within your organization. 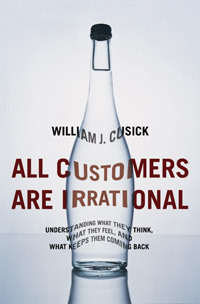 All Customers are Irrational: Understanding What They Think, What They Feel, and What Keeps Them Coming Back by William J. Cusick. © 2009 William J. Cusick. All rights reserved. Published by AMACOM Books.